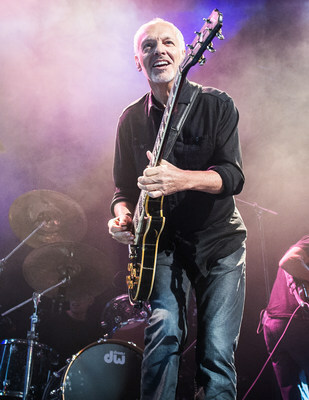 CARLSBAD, Calif., Dec. 6, 2018 /PRNewswire/ -- GRAMMY® award-winning guitarist, singer, songwriter, and innovator Peter Frampton will receive the prestigious Les Paul Innovation Award at the 34th Annual NAMM Technical Excellence & Creativity Awards (NAMM TEC Awards), being held Saturday, January 26, 2019, in Anaheim, CA. The award is given to those individuals who personify the innovative thinking of Les Paul, the Father of Modern of Music. The Les Paul Foundation partners with NAMM each year to honor the individuals that have set the highest standards of excellence in the creative application of recording technology, which also celebrates the legacy of the late, great Les Paul. Frampton notes, "It is a distinct honor to receive the Les Paul Innovation Award. I would say that many of my career highlights occurred while holding an instrument in my hands that bears Les Paul's name. I was lucky enough to know him personally, and I owe him so much. He was a wonderful character as well as a genius! An incredible guitar player as well as the inventor of so much music technology. Les changed the way we record forever. I can only hope that I've been able to make a fraction of the positive impact that Les Paul made in his iconic career." Frampton is one of music's renaissance men, having begun a career in his early teens, and still making his mark today in the areas of recording and touring. A multi-platinum-selling artist, he recently celebrated the 42nd anniversary of his fifth solo album, Frampton Comes Alive!, an album that remains one of the top-selling live records of all time with over 17 million copies sold worldwide. In 2007 he won the GRAMMY award for "Best Pop Instrumental Album" for Fingerprints and in 2014 was inducted into the Musicians Hall of Fame. "Peter Frampton remains one of the most skillful and celebrated artists in rock history. He also was a friend of Les Paul's and has played a pivotal role in helping the Foundation keep Les's legacy alive," shared Michael Braunstein, Executive Director, The Les Paul Foundation. "Like Les, he is an undeniable master of his instrument and in many ways ahead of his time. We are honored to have Peter join the impressive list of Les Paul Innovation Award recipients." Frampton's storied career began at 16 as the lead singer and guitarist for the British band The Herd. By 18, he co-founded one of the first supergroups – the seminal rock act Humble Pie. His touring years have included work with a whos-who of the top names in music, such as David Bowie, Stevie Nicks, Gregg Allman, Ringo Starr, Lynyrd Skynyrd, Cheap Trick, Steve Miller Band, Bill Wyman's Rhythm Kings, and many others. Additionally, he took his eponymous Peter Frampton's Guitar Circus on the road for two years with special guests B.B. King, Buddy Guy, Vince Gill, Larry Carlton, Robert Randolph, Don Felder (formerly of The Eagles), Dean DeLeo (Stone Temple Pilots), Kenny Wayne Shepherd, Sonny Landreth, Robert Cray, and Roger McGuinn (The Byrds). Frampton's talent has also stretched beyond music and into the realm of television and film. He was called upon by Oscar-winning writer/director Cameron Crowe to serve as technical advisor for the film Almost Famous (2000) and even appeared in the film and composed several songs for the soundtrack. Frampton has appeared as himself in The Simpsons and Family Guy. Les Paul invented the solid body electric guitar, multi-track recording, overdubbing, echo, reverb and numerous other recording techniques. Without Les Paul, the music industry would not be what it is today. He is often called the "Father of Modern Music," "The Wizard of Waukesha" and even the "Thomas Edison of Music." Les founded the Foundation prior to his passing and wanted to inspire young people to invent, create, innovate, and get involved in music while exploring their own creative ideas. Today, The Les Paul Foundation works with organizations throughout the country in support of music education, engineering, and medical research. The Les Paul Innovation Award at NAMM and the Les Paul Spirit Award are two of the most prestigious awards celebrated by the Foundation. Announced early this year, Leslie Ann Jones, the Grammy-winning groundbreaking engineer, producer, and Director of Music and Scoring for Skywalker Sound, will be inducted into the NAMM TEC Hall of Fame that same night. Jones joins luminaries Rose Mann Cherney, Skunk Baxter, Hal Blaine, Jack Douglas, Nathan East, Geoff Emerick, and others with her induction, the industry's highest honor for pioneers of audio technology and the music industry's most accomplished producers and audio technicians. The NAMM TEC Awards are held during The NAMM Show, the global gathering of music, sound and event technology industries, in Anaheim, California, January 24-27, 2019. They are bestowed annually in honor of the many individuals, companies and technical innovations used in sound recordings, films, broadcast television and video games. Nominees were announced earlier this year. Purchase tickets on site or in advance here for $65 (General Admission) or $195 (VIP). The show begins with a VIP-only reception at 6PM, followed by the awards ceremony at 7PM, held in the Hilton Anaheim Hotel's Pacific Ballroom. Stand-up comedian and entertainer Demetri Martin will host the ceremony. Les Paul formed his foundation to encourage young people to pursue their curiosity and innovation about music, sound and engineering. Recent grants from the Les Paul Foundation include funding to multiple music education programs and to museums that tell the Les Paul story. The foundation's comprehensive website at www.lespaulfoundation.org connects viewers to numerous resources. The mission of the Les Paul Foundation is to honor and share the life, spirit and legacy of Les Paul by supporting music education, engineering and innovation as well as medical research. The foundation is based in New York. Follow the Les Paul Foundation at www.facebook.com/lespaulfoundation, https://twitter.com/lespaulfound, www.instagram.com/lespaulofficial or click on lespaulfoundation.org.